School/Community Publications These news sources crave positive pieces about student involvement. Focusing on community or school-centric publications will increase the recognition of your chapter. Get in touch with the editors for various publications, usually via the web or through your school, and send them a quick press release of your success. Be sure to include your contact information, a detailed quote in the release and a quality image they can use, if they so choose. The easier you can make it for them to get the word out, the more likely it will happen! to announce your positive DECA experience to the Board and those in attendance. Being able to hear the successful stories of their students will boost the morale of the school board by bringing their focus back on the students. They’ll be thrilled to hear you share the positive experiences you had from a school organization! Local Government Officials With demanding, on-the-go careers, your local government officials love to hear good news from students like you in their community. Local leaders, such as mayors and aldermen, strive to be accessible by their constituents, so get in touch with them when you have a victory to share. The more your story impacts the community, the more they’ll love it! See if your official can give a mention to your performance on their website or newsletter, or even see if they can issue a courtesy resolution to congratulate you and DECA chapter for your positive experiences and impact. 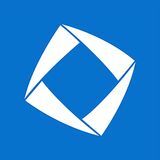 DECA Dimensions We want to know! With chapter updates in every issue, DECA members, advisors, alumni and professionals from around the world love to see the creative and successful activities of other chapters. 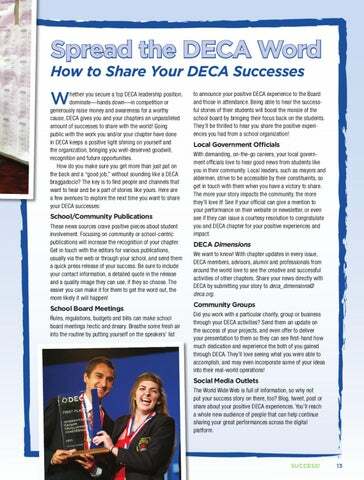 Share your news directly with DECA by submitting your story to deca_dimensions@ deca.org. Community Groups Did you work with a particular charity, group or business through your DECA activities? Send them an update on the success of your projects, and even offer to deliver your presentation to them so they can see first-hand how much dedication and experience the both of you gained through DECA. They’ll love seeing what you were able to accomplish, and may even incorporate some of your ideas into their real-world operations! Social Media Outlets The World Wide Web is full of information, so why not put your success story on there, too? Blog, tweet, post or share about your positive DECA experiences. You’ll reach a whole new audience of people that can help continue sharing your great performances across the digital platform.